Izzy’s first term at school went surprisingly well. I was a little nervous for her to be honest but after running straight off to the paint table on the first day, I knew she’d settle ok. She goes into class happily each day and comes running out at home time happy. Starting reception has gone fairly well! As some of my regular readers may remember, Izzy started toilet training a few weeks before starting school. I am extremely thankful she’s managed a whole term with only one small accident at school. I expected a fair few more accidents! Izzy is confident using toilets anywhere, she can change herself if she does have an accident too which I am really pleased about. Anyone that has met Izzy will know she is a joker! She loves to make people laugh and has a fantastic sense of humour. Izzy made this clear to her teachers from day one. For the first week or so children wear name badges to help teachers learn their names. Izzy is of course Isobella, so we reminded her this is what was on her name badge. Obviously Izzy’s mischievous brain decided that was a great way to prank her teachers. Several teachers spent a while calling Isobella, she acted oblivious. A learning support aid sat with her for a while and asked if her hearing was ok. She told Izzy teachers kept calling her but she wasn’t responding. Her reply? ‘I can hear them fine but I prefer Izzy!’. So of course the LSA suggested changing her name label to Izzy but she refused, leaving teachers confused all day! When the Mr collected her at the end of the first day he asked for Isobella, the teacher laughed and asked if he meant Izzy and explained what had happened. Izzy came bouncing out laughing her head off as she had pranked her teachers on the first day of school!!! As anyone with a 4/5 year old in reception will know, you never hear the full story! Izzy says she has no friends yet according to the Mr comes out chatting to other children daily. Eva was meeting Izzy at the dividing fence between upper and lower school for the first few weeks. Unfortunately, this led to Izzy getting upset each time Eva went back to class. I was also worried this may make it harder for Izzy to make friends at break time. The girls weren’t too happy about it but I encouraged them to play with their friends and catch up on the way home from school instead. Izzy has a mix of packed lunches and school dinners across the week. She gets on well with her school dinners but I’m finding packed lunches can be tricky for her. She struggles to open her drink and some packets so occasionally she has come home with half her lunch & drink untouched. We have been using half term to teach her to do these things properly so hopefully next term there won’t be any issue. The idea of getting both girls ready each morning filled me with dread to be honest. Eva isn’t one for just getting on and doing what’s needed, she needs constant reminders which can be stressful! Thankfully Izzy is ready in under 5 minutes and can mostly dress herself, put on her shoes etc. This makes mornings easier than I had imagined, now I’m only left chasing one child around. Overall, Izzy has had a great start in reception. She likes her teacher, loves the sandpit, paint table & play dough (nothing new there!) and seems to be getting on ok. She has moments where she say she doesn’t like school, but that’s more because she’d rather snuggle up with a film and mummy! 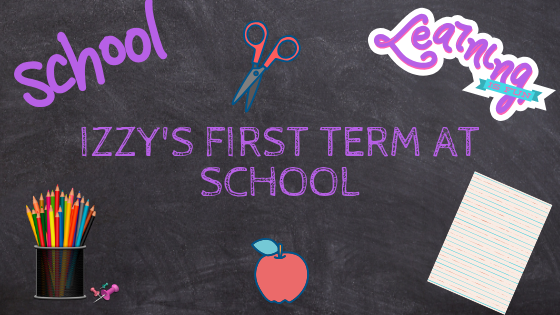 How did your little ones get on in their first term?